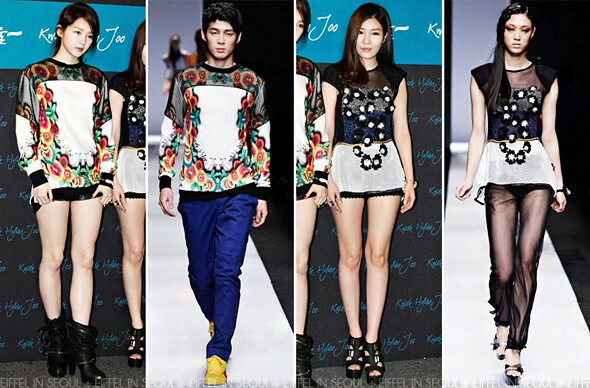 The presentation of Seoul Fashion Week Fall/Winter 2012 collections was held from April 2-7, 2012. Kwak Hyun Joo presented her collection on April 5, 2012 at SETEC in Seoul, South Korea. Several stars like Lee Chung Ah (이청아), Nam Gyuri (남규리), Davichi as well as Jaekyung (재경), Jisook (지숙), Hyunyoung (현영) from Rainbow were invited to the fashion show. Check out what they were wearing at the event. Lee Chung Ah (이청아) was my favorite at the event. She was the most 'covered up' at the fashion show while the rest of the ladies were in mini dresses and hot shorts at the event. I simply love the color of the dress with her accessories. I also loved that she was different from the rest. 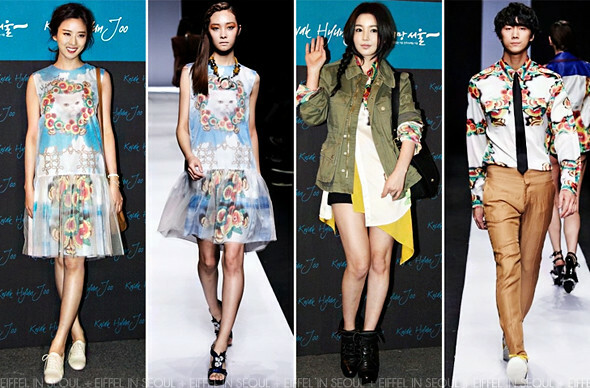 Nam Gyuri (남규리) wore a printed blouse from Kwak Hyun Joo Spring/Summer 2012 collection. Layering her look with a yellow blouse underneath, black shorts and a khaki outerwear. Black boots and bag to complete her look. Love the style direction of Nam Gyuri (남규리)'s outfit. Lots of layering. Kang Min Kyung (강민경) opted for a printed sweater with mesh details from the same collection. A pair of leather shorts and Suecomma Bonnie boots to complete her look. Lee Haeri (이해리) was also one of my favorites at the event simply because she wasn't in Kwak Hyun Joo's prints. I love the blouse on her, I only wished she wore those sheer pants seen on the runway. Jaekyung (재경) was my best dressed among the three members from Rainbow. I love the dress with the red accessories she wore. Only pet peeve about her look are those black boots. Jisook (지숙) wore a striped dress from Spring/Summer 2012 collection. Brown sandals to match her look. Orange crossbag and a crown (weird) to complete her look. Hyunyoung (현영) was my worst dress at the event. The crop top is fine but those patent shorts just look incredibly tacky and simply skimpy.